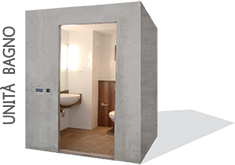 Bathsystem are experts in the production of prefabricated bathrooms and kitchens in concrete and in steel. Established in 1993 in response to the growing building market demand for off-site construction solutions from Construction Companies, Architects, Hoteliers and Developers, Bathsystem has continually increased its annual sales providing a perfect merger between quality - which keeps the best tradition of the product Made in Italy - and the market demands to develop solutions embracing the equal needs of functionality and design. Bathsystem operates four factories near Brescia Italy, two in Molinetto and two in nearby Calcinato with a total area of about 21.000 sqm, and produce over 6.000 pods per year. The Company is a major provider in the UK and Ireland and it has also a significant role in Spain, Portugal, Germany and France. Bathsystem structures can be adapted to every building type, Residential Apartments, Hotels, Hospital and Student Accommodation.